Sandstone tiles are available with various colors like Grey, Brown, White, Beige, Chocolate,light yellow and multi colours. 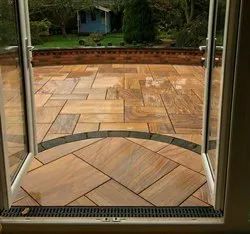 Sandstone tiles are demanded for wall cladding, paving, flooring and sandstone tiles could be use for every types of application. Sandstone tiles are available with various finishes like Natural, honed, sandblast, mirror polish, leather finish, flamed, antique and many more. We provide these sandstone tiles at very competitive price to compare with market price. We are leading manufacturer, Exporter and supplier of Rainbow sandstone Tiles. Rainbow sandstone tiles are highly demanded for Wall Cladding and flooring. These sandstone tiles are available with various finishes with customized sizes. 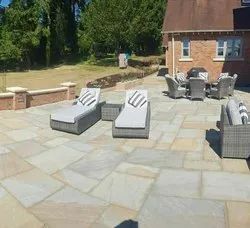 We are leading manufacturer and supplier of Outdoor Flooring Stone Tiles made of natural sandstone which is highly demanded by architects and landscapers for Outdoor Flooring. 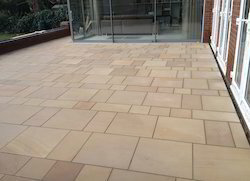 Sandstone tiles are finest and cheapest options for Outdoor Flooring to compare with granite cobbles. 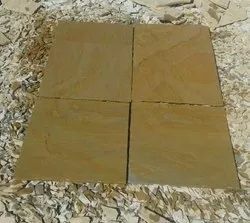 Two tone sandstone are having natural double color like Grey and Yellow, Grey and Brown. It gives designer look in Garden, Pathway and outdoor flooring applications. This is having quartzite property which is hardest form of sandstone. Because of its hardness it is highly demanded by architects and landscapers for outdoor flooring applications. Buff Sandstone tiles are very popular for wall cladding, Flooring, Pool coping and exterior applications like paving and landscaping etc. We providing various finishes on it like Brushing, Calibration, Tumbling etc as per customers demand. Natural riven surface available with hand-cut and machine cut edges. We are leading manufacturer and supplier of Teakwood Raibow sandstone tiles. Teakwood Rainbow sandstone tiles are highly demanded for Wall Cladding and flooring.